Produced by BasketballCoach.com & Championship Productions! You won't find this video sold for less anywhere! Guaranteed! Watch four live practices featuring a wide variety of strategies, skills and drills from former Bill Self assistant Danny Manning. Sit in on live practices featuring distinguished member of the National Collegiate Basketball Hall of Fame and former Bill Self assistant, Danny Manning. Throughout Coach Manning's practices you will see individual defense, the 2-2-1 three-quarter court press, offensive sets out of a 1-4 high, transition game and more. And, great attention to detail! 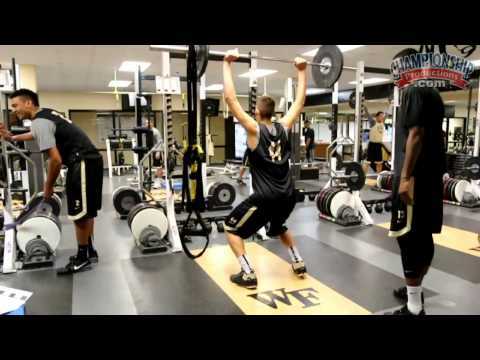 The Wake Forest coaching staff begins with the basics, both defensively and offensively. Proper technique for defensive movements and an attention to detail on offense is emphasized. Defensively, Coach Manning and his staff work on slides, making sure each player is low to the ground and making explosive movements. Closeout techniques are also taught. The Concepts drill reviews five of the core principles of man-to-man defense. This drill works on closeouts, defensive stance, denying the point-to-wing pass, fronting the post and reacting to the dribble while in help. Offensively, the Demon Deacons review their sets out of a 1-4 high alignment. In a 5-on-0 setting, players walk through the plays without the distraction of dribbling the ball without intent. Coach Manning teaches strategy not only in terms of steps A, B, C, but also challenges players to recognize how to make defenses move to their advantage. His staff emphasizes the timing of cuts, the use of screens and the footwork involved with each play. This thorough review works on a wide variety of reads out of each play. The disc concludes with team strength and performance training in the weight room. The Demon Deacons' strength coach meets with the coaching staff to show how the team is expending energy and the impact of recovery days on strength and performance workouts. Coach Manning and the Wake Forest staff spend a significant amount of time working on their 2-2-1 3/4 court press, which drops back into a 2-3 zone. You'll see the press breaker the Demon Deacons run against this type of zone pressure. You will also see how Manning runs press breakers against man-to-man full court pressure and man-to-man sideline out-of-bounds 3/4-court pressure. Defensively, Coach Manning uses breakdown drills to work on defending specific offensive actions like dribble hand-offs and staggered double screens. 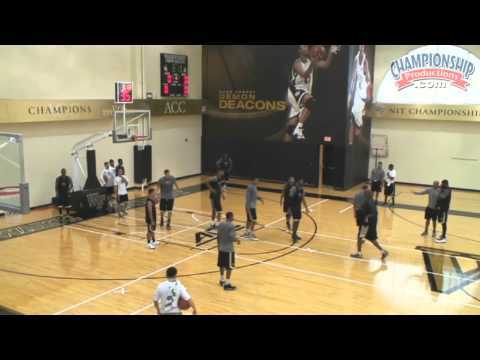 In the Shell Drill, the Demon Deacons learn how to take away front cuts and react to baseline dribble penetration. In this 4-on-4 drill the team reviews how to defend back screens and flare screens. You will see a great drill for working on "blitzing" or double-teaming ball screens. 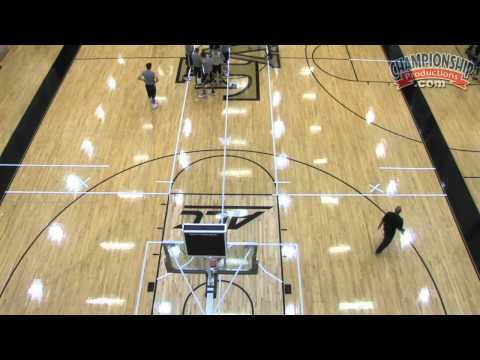 The Wake Forest coaching staff ensures the team gets plenty of shots up in the Hurricane Drill, a fast-paced transition shooting drill that uses multiple basketballs. On the offensive end, the team is broken down into guards and post players for skill development drills. While the forwards work on scoring off front pivots and reverse pivots, the guards work on coming off ball screens and pin downs. From here it's all about learning to work as a team. Starting from a box-out situation, the team runs through plays 5-on-0 at the other end. Watch as Coach Manning's team competes in 3-team and 2-team scrimmages. In the final segment of the practice, you'll see how Coach Manning works on baseline out-of-bounds versus man-to-man defense.